Murder is always a bestseller. Kate's book trailer features a uniquely bound version of Goethe's Faust, the book at the center of the mystery behind Homicide in Hardcover, and is the creation of master bookbinder Don Taylor of Toronto. "This first in a new series is going to launch Carlisle to a bestselling position and have readers looking forward to the next installment of delightfully eccentric characters, droll dialogue and a meticulously planned crime. Bibliophile heroine Brooklyn Wainwright is brilliant, feisty and funny." "Let's just say it up front—I really enjoyed this book. For once I am very happy this is part of a series because I want more. This book is unusual in that it has both a strong mystery and unique, well-created characters...Thank goodness for Kate Carlisle"
"The bare bones of the book are quite good and the story is pleasantly readable...The premise was interesting." "Kate Carlisle. Remember that name. I have the feeling you'll be seeing it a lot in years to come. 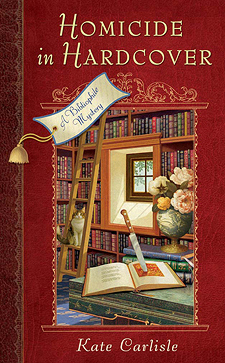 Carlisle bursts onto the publication scene February 3rd with her debut release, Homicide in Hardcover, a bibliophile mystery that kicks off what I hope will be a very long-running series." "HOMICIDE IN HARDCOVER is a fun, fast-paced mystery that is laugh-out-loud funny. Even better, it keeps you guessing to the very end. Sure to be one of the very best books of the year! Welcome Kate Carlisle, a fabulous new voice in the mystery market." "Brooklyn is my kind of detective! She loves books, wine, chocolate—and solving mysteries! Kate Carlisle has crafted a fabulous new series with great food, great books and lots of fun." "A cursed book, a dead mentor, and a snarky rival, send book restorer Brooklyn Wainwright on a chase for clues—and fine food and wine—in Kate Carlisle's fun and funny delightful debut." "Beautiful and brilliant Brooklyn Wainwright thought bookbinding was a low-risk occupation but she soon discovers her mistake in Kate Carlisle's smart and sophisticated page-turner." "Who'd have thought book restoration could be so exciting? When Brooklyn Wainwright inherits the job restoring the priceless copy of Goethe's Faust from her murdered mentor, her studio is ransacked, she's stalked, and the bodies pile up around her. Is it the famous Faust curse? I'm not tellin'. But, trust me, you'll have fun finding out. Homicide in Hardcover is good reading in any binding." "Welcome to the fresh and funny world of bookbinder Brooklyn Wainwright. A delicious mix of San Francisco, book restoration and a lingering counterculture best by murder. Who knew leather and vellum could be so captivating!" "Saucy, sassy, and smart—a fun read with a great sense of humor and a soupcon of suspense. Enjoy!"